Seahawks 12thPup Fans Getting Ready for Some Football! We are so excited for next weekend to come! And we are even more excited that once again, we are headed to the Superbowl! Yes we spent this weekend getting ready for next weekends big party. 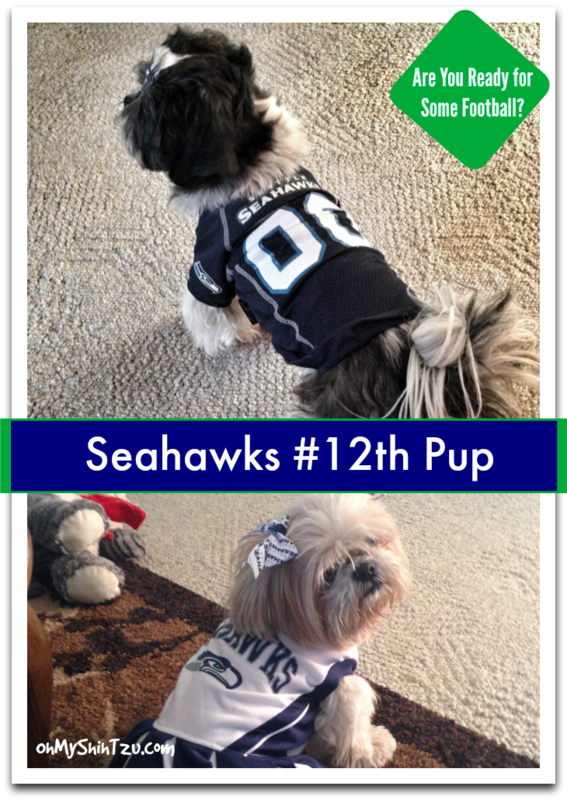 From banners to balloons, these little Seahawks 12thpup fans are ready for another great party Shih Tzu Style! The girls are ready for Super Bowl XLIX in their 12thPup Gear! Okay, so “we” are really not going to the Superbowl, but we will be cheering our favorite team on as they, the Seattle Seahawks defend their Super Bowl title! We have been a little superstitious this season, as the girls decided they were going to wear last seasons pup jerseys and not get new ones. Yup, those jerseys gave us luck last season, so we are hoping that things continue the way they are… I mean did you see the NFC Championship game against the Packers? Talk about edge of your seat game! Put we aren’t just dressing up for the big game on Sunday. We are also going to have a #12thPup Party! Yup we are going to party it up with yummy tasty treats for the pups. The menu will include yummy stuff like Barking Better Bacon Burgers, Shih Tzu Sweet Potato Fries, Seahawks Blueberry Milk Shakes and a few other tasty treats all for the Shih Tzus. We will have game day coverage via Twitter, of all our antics in the kitchen as a pre-show party! If you don’t follow us on Twitter make sure you do HERE! 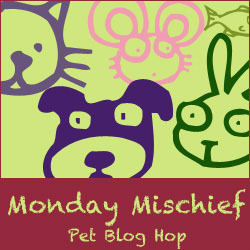 We are so excited once again to be joining Monday Mischief hosted by Snoopy’s Dog Blog, Alfie’s Blog & My Brown Newfies! You all are too cute!! those outfits are too cute!!! We are actually pulling for the Seahawks too! Rachel Sheppard recently posted…Why does is it Seem Like the Vet Costs So Much? Oh my goodness. You have much more energy than I have. lol I’m sure you’ll have a fun party though! Yay! Admittedly we don’t get the whole SuperBowl craze, but we think the girls are adorable in their SeaHawks jerseys – the team comes from Washington STATE right? LOL. You two look so cute in your team shirts. I’m sure you are all ready to bark, bark, bark for your team! I’m going to be online to watch all the ‘goings on’ within Team Dog vs. Team Cat! How adorable are those jerseys?!?! I love the matching bow. #GoHawks!! Gonna B a fun Sunday! Love the 12th pup idea! We are gearing up, too! What a cute pic! The boyfriend is watching football. Mr. N and I are going to go for a walk and avoid the drunks lol. 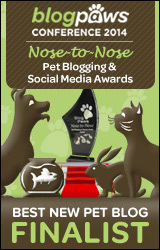 Can’t wait to follow the pawty via Twitter!! Loving the gear! Good luck to your team at the big game. We’ll be watching too! Look at you, you’re certainly ready, aren’t you? We don’t play football, our favorite sports is chasing squirrels and bunnies. Everyone looks ready to cheer! Go ‘Hawks!! Oscar and I are more hockey than football, but we do enjoy some chili and natchos! You guys look amazing in your jerseys! We are sad that the Cardinals have to “clean out their lockers” for the Superbowl teams, but it’s lots of fun around the city w/ people attending the Pro Bowl and the Superbowl. Lots of fun & excitement all around the city of Phoenix! Enjoy your Superbowl pawty! Cathy Armato recently posted…Do Landlords Hate Pets? Harley’s getting ready too! He’s going to do a little pre-football partying on Wednesday. Can’y wait. And of course he’s a Seahawks fan also. Yeah Harley!! So glad to hear he is part of the 12thPup bandwagon!! These are such cute ideas! I think a trip to Michaels is in store! So have you two practiced your cheer yet? Break out the pom poms! We haven’t seen any cuter Seahawk fans around than you guys! Go Seahawks!! !